The Architectural Marvel That Is ... Qualcomm Stadium? Those were all things a group of about two dozen architects and architecture students said as they toured a San Diego building this week. They were talking about Qualcomm Stadium. Yes, the Qualcomm Stadium that the Chargers hate so much they might leave the city over. The Qualcomm Stadium that draws Yelp reviews from fans calling it “old, decrepit and an eyesore.” The Qualcomm Stadium that NBC analyst Chris Collinsworth called “a terrible stadium” that was arguably the worst in the NFL. Late last week, I tagged along on a behind-the-scenes tour of Qualcomm, which is considered an architectural gem in certain circles. The tour was organized by the local chapter of the American Institute of Architects. Qualcomm Stadium is one of just two San Diego projects to have won a prestigious, national AIA award (the other is the famous Salk Institute for Biological Studies). Completed in 1967, the massive concrete stadium is an example of a style of mid-century modern architecture called brutalist. The stadium was designed by San Diego firm Frank L. Hope & Associates. Frank Hope Jr., principal of the firm when it landed the stadium contract, joined Thursday’s tour to help Marshall dive deeper into the design of the multi-use stadium, which has hosted three Super Bowls and two World Series. 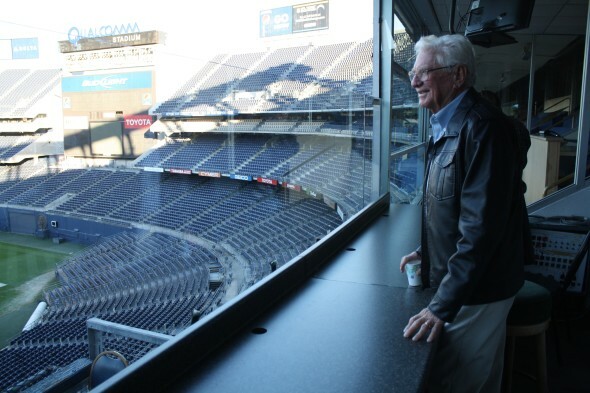 After a brief introduction and a failed attempt to watch a short documentary detailing the construction of the stadium (some of the electrical outlets in the club lounge weren’t working), Marshall led the group through the walkways, press boxes and locker rooms inside Qualcomm. The big recognizable concrete circular entrance ramps inspired most on the tour to whip out their phone cameras and snap pictures. “I love these ramps,” one woman said. Stains on the concrete, smells emanating from restrooms and other wear-and-tear was evident in the nearly 50-year-old building. But Hope said he thought things were going to be much worse. That historical status doesn’t mean the stadium can’t be torn down. If the city does opt for demolition, though, it’ll need to do something to soften the blow, like document the building through historical reports and photographs, or possibly create some kind of interpretive display. Hope and Marshall told the tour crowd they recognize the old stadium’s need for an upgrade – smaller things like a new Jumbotron, plus larger construction projects like moving the club houses so they have views of the field (they currently offer views of the parking lot). Overall, though, the pair said they think the building’s worth saving. Meanwhile, the city has shown no signs of a last-minute embrace of Qualcomm Stadium. The mayor’s office recently doubled down on the effort to build a new stadium in Mission Valley by releasing a video showing off the design concept. Even if the city does ultimately demolish Qualcomm, Marshall has some ideas on that front too.